The paid listings on the page (in red) are achieved using google adwords (before setting up an account have a good look round as there’s often free £20-£30 vouchers available for 1st registering). In your new shiny adwords account you can select the keywords or phrases you want to target, the text to appear in your advert and how much you want to pay every time someone clicks on your advert. The more you pay the higher up the page you’ll appear (it also takes in to account the click-through-rate so its worth playing with the ad to make it the most enticing). To give you an idea I would expect people at the top of ‘marquee hire’ paid ads to be paying between 30p-£2 per click. 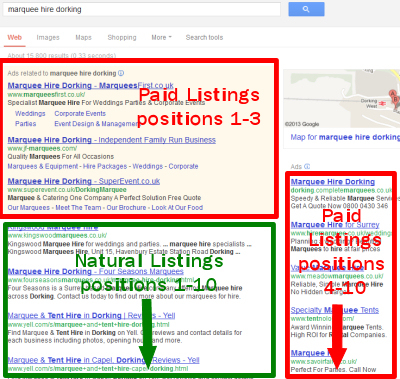 In contrast for ‘marquee hire Dorking’ I would expect the top listing to be paying 5-10p per click. So you can see it’s worth targeting more local and focused wording (marquee hire mytown) than more general, expensive terms like just ‘marquee hire’ or ‘marquee hire uk’. The natural listings appear beneath the top 3 paid listings (if you look closely the paid listings have a shaded background). Getting to the top of these listings is a bit of a science (called SEO – search engine optimisation) and takes a long time. There’s lots of information and tools out there to help get you to the top so you can teach yourself how it’s done, just avoid dodgy ‘black-hat’ techniques as google will strike off your website. Again targeting the more local phrases is a better bet than the more general terms. We know a fair bit about SEO so can give some tips if required. Finally it is well worth registering for ‘Google Places for business’, this often means your business will appear on a small map next to the listings or even as one of the high natural listings – like the map in the top right corner of the example image above. It’s free and absolutely essential to do.